Fantastic Beasts and Where to Find Them has several things in common with J.K. Rowling’s other wizarding world movies. And I don’t mean wands and Grindewald. J.K. Rowling wrote Fantastic Beasts and Where to Find Them as an original screenplay, whereas the Harry Potter movies were adapted from her novels. 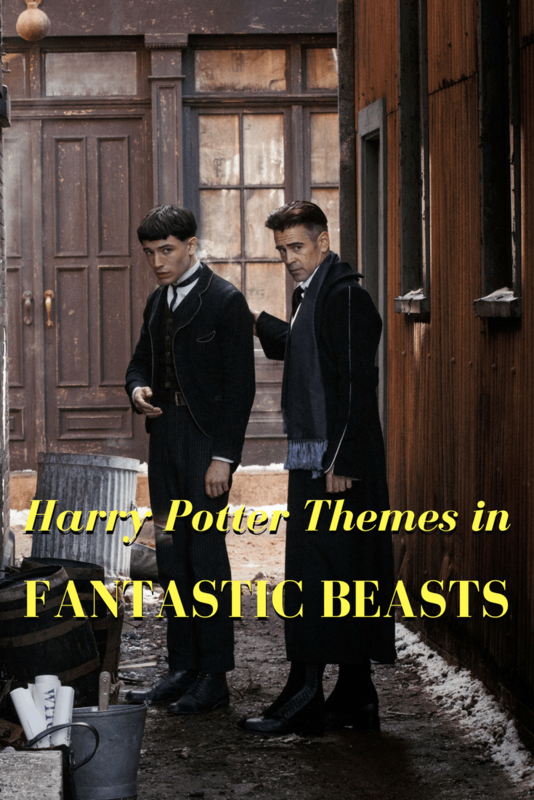 Fantastic Beasts marks her first time writing something original in a completely new format. The story is about Newt Scamander (Eddie Redmayne), who arrived in New York City, sometime in the 1920s or ’30s, to capture a rogue magical creature. While he’s there, the other magical creatures inside his case escaped and caused a good deal of mayhem. He spent the rest of the movie trying to capture them. Even though this story took place in America, and in a different time period, Fantastic Beasts and Where to Find Them had similarities to the Harry Potter story. Like other J.K. Rowling stories, Fantastic Beasts and Where to Find Them started out as a fun and frivolous adventure, but turned dark and deadly before the end. Harry Potter and the Sorcerer’s Stone, her first book, had some danger and death in the story. But the series didn’t delve into truly dark territory until Harry Potter and the Prisoner of Azkaban, the third book, when Sirius and the Dementors came on the scene. Fantastic Beasts and Where to Find Them was pretty grim all-round. To start with, the production design involved almost no color. The sets, costumes and landscape were gray gray gray. That may have been to make the world inside Newt’s case look even livelier, but man, I just wanted someone to turn up the lights! 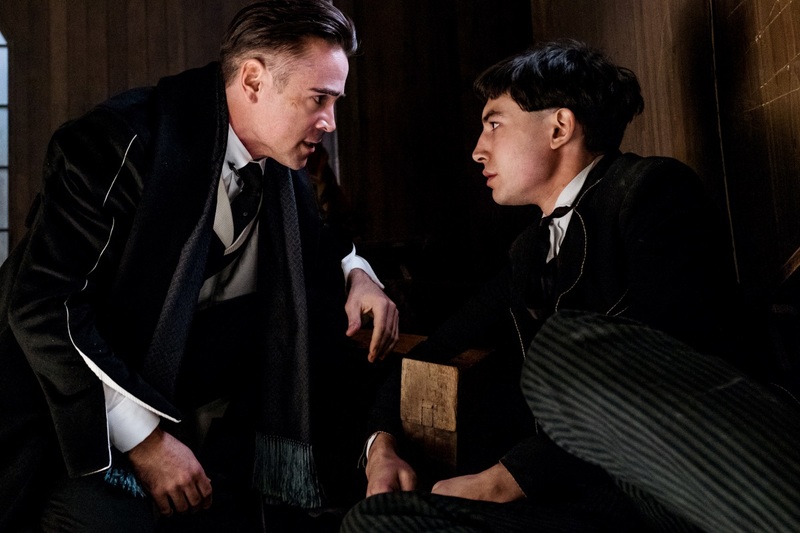 The scenes between Graves (Colin Farrell) and Credence (Ezra Miller) were pretty darn creepy. And yes, those were sexual undertones you sensed in those scenes. I interpreted them as Graves being a predator to Credence’s prey. Credence was attracted to more than just getting a pat on the head for a job well done. Remember, Graves turned out to be Grindewald, who was gay. (I’m not saying everyone who is gay is a predator!) I believe there was a intimacy forming between them that made Credence’s pain all the worse when he was betrayed. Dark stuff, indeed. Another common theme in Fantastic Beasts and Where to Find Them and the Harry Potter books is the unfairness of a class system. Throughout the seven Harry Potter books, Muggles were looked down on by a group of wizards. Then we learned that Pure Bloods looked down on Half-Bloods and Mudbloods, as well. Other magical species, like giants, elves and centaurs, were also oppressed. Although Harry’s story was front and center, the story about Voldemort rising to power and eradicating entire races of beings became the overarching story. In Fantastic Beasts and Where to Find Them, wizards weren’t allowed to be with Muggles. Muggles were considered separate, and possibly lesser. Plus, a hierarchy existed in the American wizarding world, with the Ministry of Magic ranking at the top, like royalty. Along with the examination of different races and how they treat each other, mixed marriages are also a hot topic in J.K. Rowling’s books. In the Harry Potter books, particularly Harry Potter and the Deathly Hallows, several characters expressed disgust at the idea of wizards “mating” with Muggles. Voldemort detested his father for being a Muggle. Even poor Dean was on the run because one of his parents was a Muggle. The wizards and witches in Fantastic Beasts and Where to Find Them were very clearly prohibited from consorting with Muggles. 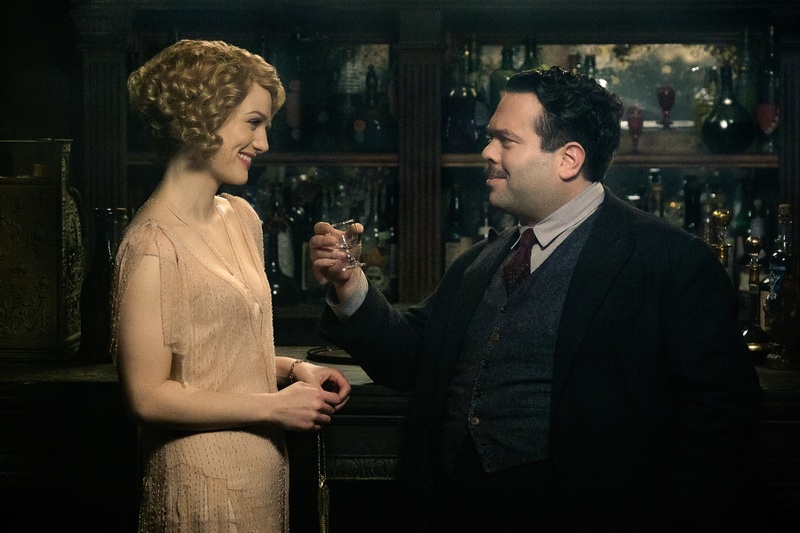 Of course, that didn’t stop Queenie (Alison Sudol) from falling for Kowalski (Dan Fogler), but they sure had to keep it secret. I don’t know J.K. Rowling’s personal religious beliefs, but from her books and Fantastic Beasts, I’d wager she’s not crazy about organized religion. Now, I don’t have any evidence from the seven Harry Potter books to point to and say, “See how she hates church?” The only evidence I can submit is that there is a complete lack of religion of any kind. The only kind of worship that’s mentioned was of Voldemort, as well as the Deathly Hallows. Sort of. Religion wasn’t depicted nicely at all in Fantastic Beasts and Where to Find Them. 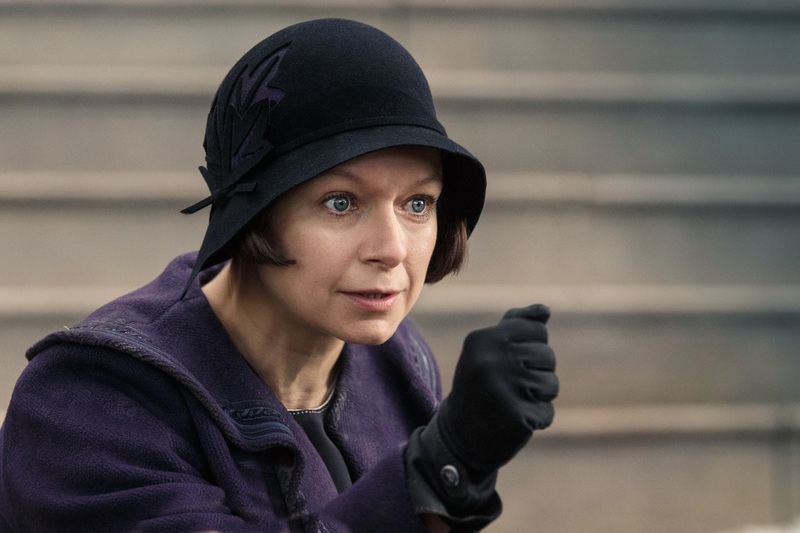 Mary Lou (Samantha Morton) used Christianity like a weapon. She claimed to be a God-fearing woman, but she abused the orphans in her care in more ways than one. She lacked compassion completely, for strangers and “loved” ones alike. She wore her self-righteousness like a badge, like armor. Speaking of orphans, the loss of parents is a big, big theme for J.K. Rowling. The most obvious reference is Harry Potter, himself. He was orphaned when his parents died at the hands of Voldemort, who was also an orphan. Neville Longbottom may as well have been an orphan, because his parents were locked away in Saint Mungo’s Hospital for Magical Maladies and Injuries. Later, after Hermione had to Obliviate her parents before she went on the run, she talked to Harry about how her parents wouldn’t remember her, essentially becoming an orphan. There’s a whole house full of orphans in Fantastic Beasts and Where to Find Them. Their care wsn’t top-notch. No doubt this depiction was informed by J.K. Rowling’s own mission to make orphanages better, in countries like Hungary and Romania. She started out using her own money and fame to do something about the cages and malnutrition she found in orphanages she toured. Then she started her own charity, Lumos. Another theme in J.K. Rowling’s work is that ol’ chestnut “with great power comes great responsibility.” She depicts people with power going out of control. In the Harry Potter books, Minister Fudge was very reluctant to give up his position. His delay in acting against Voldemort was one of the reasons the Dark Lord was able to gain a foothold in the wizarding world. Plus, Voldemort was the ultimate in out-of-control power. Graves, in Fantastic Beasts, was out of control too. He worked independently from the very Ministry of which he’s part. He abused his power in his attempt to get even more power. And while Minister Seraphina Picquery (Carmen Ejogo) wasn’t a dictator, she was quick to jump to unfair conclusions about Newt and his friends. Thanks for reading! Which wizarding world movie is your favorite? Tell me in the comments!